What's an OMC Electric-shift "Stringer?" 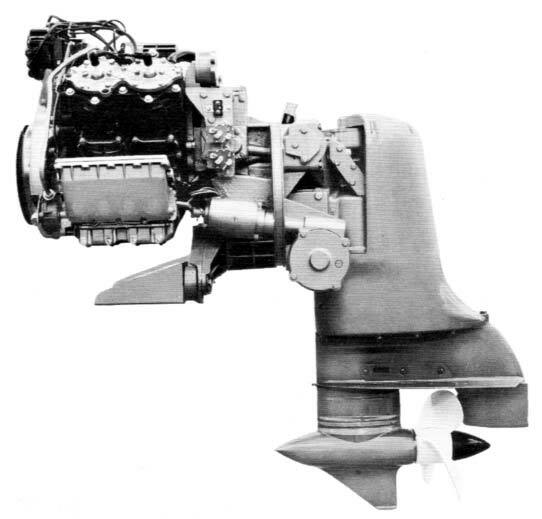 OMC studied the emerging stern drive market (which included 16 other manufacturers) before debuting in 1962, with the lightweight, oil-injected Model "480," initially rated at 80-hp, (eventually developing 88 and 90-hp).The 480 was developed to power the innovative OMC 17 Deluxe boat. The original power-head was the 89.5 cu. in. 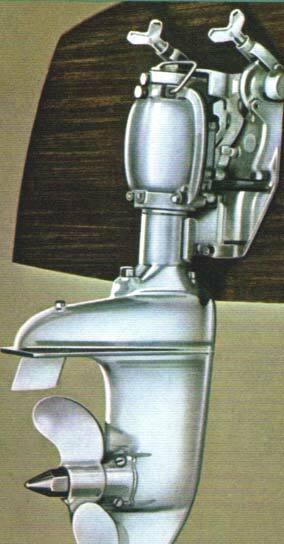 displacement, 2-stroke V-4, derived from the 1960-61, 75 hp Evinrude/Johnson outboard. First-generation OMC "Electric Stringer" stern drives shared either the push-button (Evinrude) or single-lever (Johnson/OMC) remote control to shift the electro-magnetic, spring-shifted, bullet-shaped lower units, first introduced on highline 40 & 75 hp OMC outboards for 1962. An innovative fuel injection system was planned for the 480, but did not see production. However, the oil injection system did do away with the need to premix 2-stroke oil and fuel. From the beginning, all OMC sterndrive units had ball-gear drive and "floating" live-rubber mounting for smooth, quiet operation. Standard equipment on all models included: electric power lift/tilt, remote control electric shift, with choice of push-button or single-lever control, and a choice of several propellers in various pitches. The electric shift used ingenious, electromagnetic coils to engage either forward or reverse clutch springs. In neutral, the clutches rotate freely around the clutch-hub. When the operator engages a gear, the electric coil magnetically causes the spring to grip the clutch hub. The harder it is driven by the motor, the tighter it grips the hub, while the other clutch spring remains in the relaxed (un-engaged) position. There are no moving electrical parts to cause failure. There are two circuit wires sharing a common ground between the gearcase the the remote control helm. The original "bullet-shaped" units require 17.5 oz of OMC Type "C" lubricant in the lower gearcase. 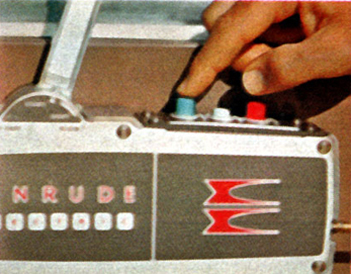 The "bullet-shaped" lower units were offered on 1962 - 1968 OMC/Evinrude/Johnson 14-ft and 16-ft boats with the "DU" sterndrive model prefix. "Bullet drives" would also see OEM-duty behind OMC Chevy II 153 (110 - 120 hp) fours (CU). The OMC V-4 (DU) was last offered in 1968 and was replaced starting in1968 with the Ford (UK) cross flow "Kent" OHV fours of 80 and 90 hp (NU) through 1971. Early (1961) pre-production 480 prototype (above). Note lack of top cap and curved exhaust housing. Anti-cavitation plates were extended forward of gear case on production units (below). In 1964, OMC introduced a more robust (higher thrust rating) heavy-duty, electric-shift lower unit and introduced three GM-sourced engines: 1) 120-hp Chevy inline (153) four, 2) 150-hp Buick (225) V6, and 3) the 200-hp Buick (300) V8 (later in 1966). OMC engineers evaluated and rejected the Chrysler Marine 225 "Slant Six," which used a novel, low-profile "pancake" horizontal mounting. Instead they pioneered the marine use of the space-efficient V6, an engine configuration that remains popular with boaters some 40 years later. OMC engineers would replace the Buick V8 with the small block Chevy V8 in 1969, followed by the Buick/Jeep V6 being replaced by the Chevy inline 6 in 1973. In the 1975 the 302 and 351 Ford V8's were added in 175, 190 and 235 hp offerings. The higher-thrust sterndrive units require either 33.9 oz (1969 - 1977) or 37.2 oz (1964 - 68) of OMC Type "C" lubricant in the lower gearcase. They are easily identified by their more robust and gently "rounded" gearcase, as shown below. The first-generation, electric-shift OMC drives remained in production through 1977 with various engines from GM and Ford. (View model number listing.) Many evolutionary design improvements were made during the 15-year production span. For 1978, a second-generation, ball-gear OMC Stringer (400/600/800-series) design with a redesigned (V4 - V6 outboard inspired, thru-hub exhaust) lower unit, which remained in production until 1985-86 and shared many upper gearcase design features of the original "Electric-shift" stringer. It is important to always specify your sterndrive's model number when locating parts. 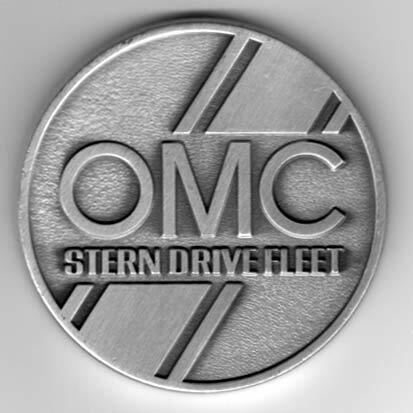 OMC engineers deployed an unusual "ball-gear" drive design totally unlike the "universal-joint" drive designs employed by Volvo and MerCrusier, ironically the OMC design drew inspiration from a 1931 Johnson stern-drive. OMC Electric Stringer in 75 degree (25 percent more than competitive models) "Hi-Tilt/Lift" position (electric motor-driven, lock-to-lock in under 4 seconds) Unit can be parked or held at any angle for mooring, trailering or lower unit maintenance. Unique clutch pack/worm and quadrant gear design permits shock absorbing action to minimize impacts of under water obstructions, while permitting efficient reversing. Shown above, is the 1966 HUE-14E, high-thrust gearcase, powered by the Buick 150-hp V6. Read the interesting history of The Great Stern Drive Conspiracy: How the Stern Drive was Invented. Why are the 1962 - 1985 OMC Sterndrives called "Stringers?" The term "stringer" refers to the unique mounting method for securing the "inboard" engine and "outboard" stern drive internally to the boat's hull using a stressed support frame much like the stringer support found in boat hulls. The "stringer" mounting system allowed retro-fitting the new stern drive power systems into existing boats without the need for building up the transom to support the external stern drive assembly (as did competitor's installations). However, many boat builders considered the stringer's mounting dimensions to be a drawback, when compared to MerCruiser or Volvo. 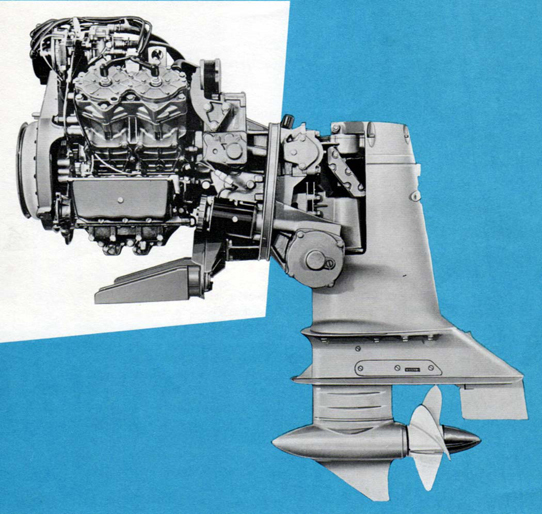 The early (pre-'72) stringers were 4-inches deeper and some 9-inches wider than their competitors, requiring boat builders to make expensive design changes to accommodate the OMC sterndrives. Another unique electric stringer design element is the transom aperture location. The large rubber boot is positioned approximately 1.5 inches "port" of the transom/hull centerline. Two stringer mounting options were initially offered: a transom mount and beginning in 1966 a floor mount. Both systems allow the entire assembly to float within a rubber seal or boot, rather than rigidly bolting the stern drive to the transom. This helps to reduce NVH (Noise, Vibration, and Harshness) and insures unparalleled smoothness. OMC's ball-gear upper drive interface also permits a full 90 degree turning radius and 75 degree "Hi-Tilt" lift position (shown above). Stringer-powered boats can turn in half the distance of other stern drives and it's not unheard of to hear of owners changing props in the water with the drive in the fully raised position. 3) True-Course worm gear and sector steering employing a push-pull cable system. 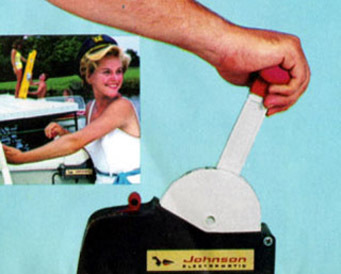 All pre-1967 Sportsman's use a very thin (1/8-inch thick) fiberglass transom, and a steel "stringer" frame for transom integrity and the upper rear engine transom mounting. The early OMC sterndrive units were all factory-pre-trimmed using metal shim plates under the front and rear motor mounts. Floor mounting is preferable in higher power installations as it eliminates transom stressing and can directly transmit thrust forces to hull stringers. It also permits easier adjustment thrust angle trim. In 1972, OMC engineers introduced a novel power trim system, SelecTrim, initially on four and six cylinder models, and later on V8 units. (The OMC stringer ball gear drive design doesn’t allow the drive to be tilted/trimmed under power separately from the engine without excessive wear on the ball gears.) The complete engine and drive assembly must be pivoted within the boat to trim the drive and propeller's angle of thrust. With SelecTrim, the front engine mount is power-lifted or lowered to change the propeller's thrust angle of attack. SelecTrim should not be confused with the separate, fast acting electric lift-tilt, a standard item on all OMC stringer sterndrives for trailering, shallow water operation or beaching. 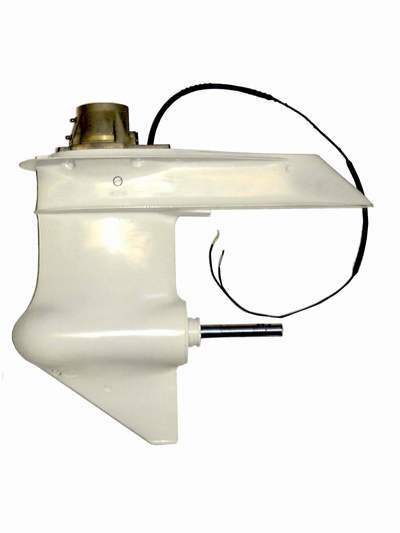 OMC stern drives were usually painted white and had a large circular rubber surround seal or boot in the transom, although later (post-1968) a rectangular boot was used. The single transom mounting ring or boot accommodates all cooling, exhaust, control and steering elements, meaning no other through-transom openings were required (very unusual for the early sixties). Propellers were pin drive and the exhaust was not through the hub, but exited behind the propeller via a port that doubled as a cooling water inlet and adjustable rudder trim tab. The "Electric Stringers" are infrequently referred to as the "Model 14-family" of stern drives, probably named so for the introduction of their 14-inch diameter props. By following some simple precautions, "Electric Stringers" can provide years of reliable service in the right hands. Don't be fooled into thinking these drives are inherently unreliable. Do not operate in reverse at more than 1000 rpm for a period longer than 3 minutes. Overheating could occur, as the intake water pickup efficiency is diminished. Always use the correct OMC "C" or "premium blend" lower case lubricant. Check upper and lower gearcase lubricant levels before each use. Change lubricant seasonally. (Protect the electro-magnet coils & springs). Do not electrically engage forward or reverse gear switch for long periods of time as electric shift coils draw a battery current of 2.25 amps (when switch is on) have no way of cooling out of the water. (You also will over heat the ignition coil and ballast resistor when the ignition key is left on for extended periods of time). Always shift or engage gears at lowest possible engine idle speed, ideally less than 650 RPM. ( It's important to protect the lower unit spring tabs). Well-tuned, smooth idling engines are essential to smooth shifting. Always closely monitor engine operating temperatures, for proper impellor cooling water pump supply operation. Do not operate above 1200 RPM on garden-hose adaptor. Always refrain from changing steering angle with stern drive tilted in the "UP" position (especially when fitted with "rope/pulley" cable steering). Partially raise stern drive unit before and while trailering and while launching (to protect the lower skeg from dragging). Insure lowest part of drive unit is 15 inches above ground when on trailer. Store drive in fully down position. Do not confuse the first-generation, "Electric-shift Stringer" with the second-generation OMC 400 and 600/800-series (also referred to as ball-gear drive "Stringers") drives introduced in 1978, which used a hydraulic assisted mechanical shift and thru-prop-hub exhaust. A third-generation, U-joint-driven OMC stern drive was introduced in 1986 and that drive is referred to as the "Cobra" series. A fourth-generation, OMC/Volvo Cobra SX drive came out in 1994. A more complete OMC sterndrive history can be viewed here. OMC offered two different height profiles on these electric stern drives. A high-profile upper case exhaust cover measures 15.5"A low-profile exhaust cover is 11". Pre-1967 units use a four-bolt top cover, later units use five-bolt covers. Various combinations of gear ratios and props were offered. This table shows the various weights of the 1966 Evinrude boat models (data from factory brochures). My 1971 OMC 307 Chevy V8 modified Sportsman is also shown. Note how close an outboard-powered (1966 100 hp Evinrude or Johnson V-4)) Sport-16 is to the V8-powered, 19-ft Rogue in power-to-weight ratio.